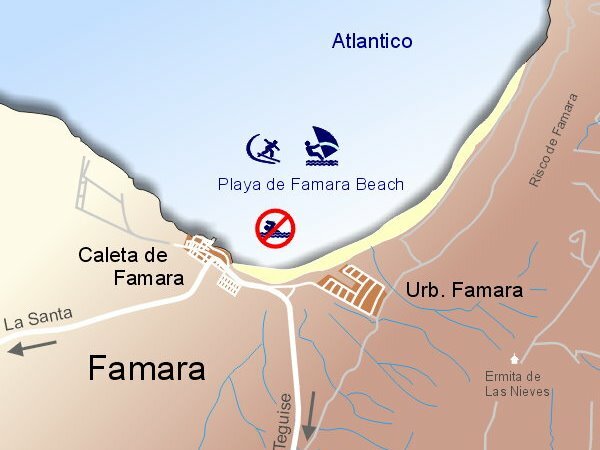 At the Famara Beach there are blowing red flags all year - swimming is forbidden! But why? 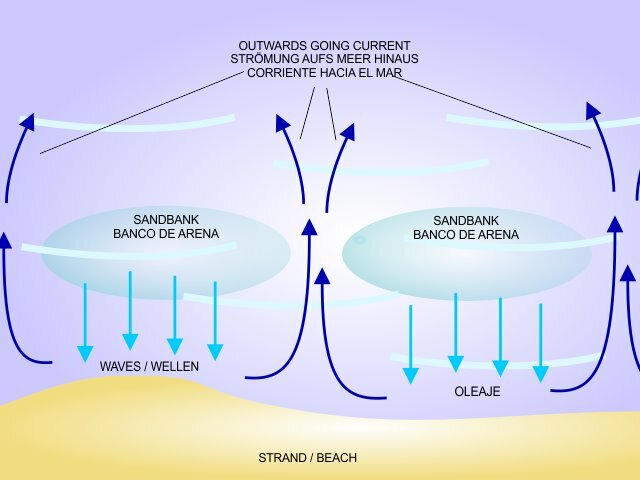 Like many oceanic islands the west coast of Lanzarote is also affected by currents, which are often descibed as below-surface currents. They can be strong enough to pull you outwards to the sea, without letting you the possibility to defend yourself. How do these currents work? There are 2 reasons that come together here: Famara usually has a strong surf (breakers), not at least because of this the Famara beach is very popular for surfers. On the other hand there are sandbanks situated in front of the beachline. Now the breakers push continiously fresh surface water towards the shore. However, this water also has to run back seawards again. That's what it does, exactly at places where are no sandbanks, as shown in our sketch. Making matters worse is, precisely at theese points where the currents occur, where no sandbar is present, the water is even deeper. The currents existing there are in any case much faster than a person can swim. Therefore it makes no sense to try to swim against, however you will be pulled out to sea. The best option is still - if you should come in such a situation - to swim parallel to the shore. Thus one arrives at a point where a sandbar is present, and the current will decrease more or less or even stop. Unfortunately you can't see where this is when you are inside the water and moreover when you are swimming for your live. Therefore the ban on swimming. 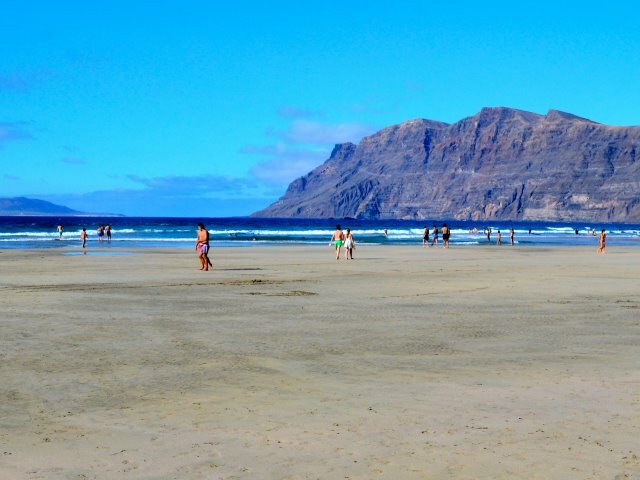 But if you comply with the rules the Famara beach is one of the most beautiful places of this island. In general - if one insists to access the water despite of ban on bathing - it is said, not deeper than to the navel, so that you always have a firm footing to stand on. And when the breakers should be so strong that you get doubts, don't go into the water at all. For me personally, the experience Famara is not tied to swimming. You can make magnificent walks here, especially at low tide the beach is very wide, and there are relatively few people there, especially in the northern part, where nudism is tolerated as well.